Best of luck to our Summer PSSA semi finalists! 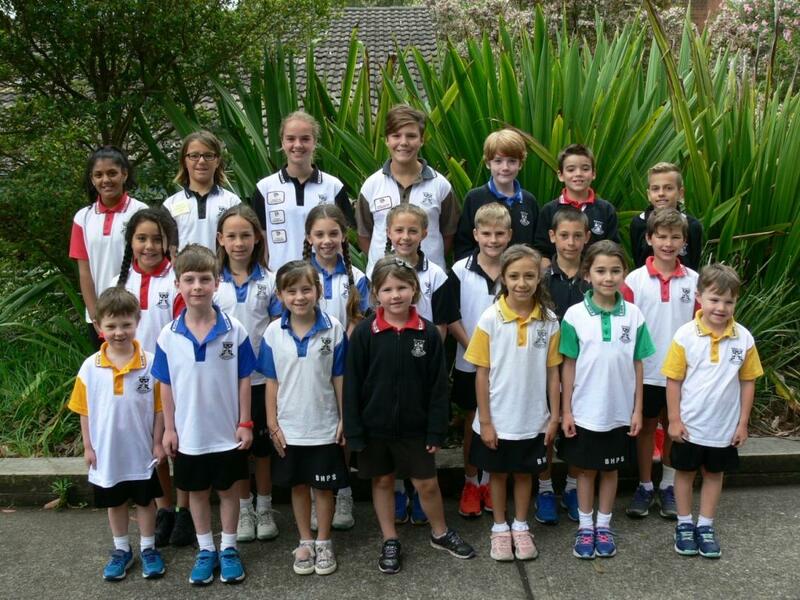 Best of luck to our Summer PSSA semi-finalists and their coaches this Friday. 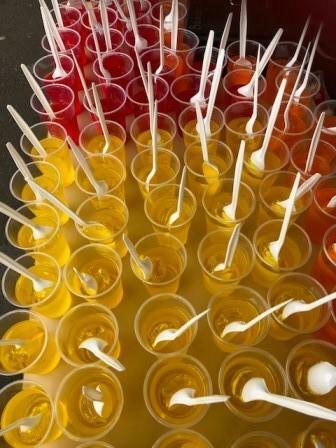 We look forward to cheering on our Junior A Girls' Eagle Tag, Junior B Girls' Eagle Tag, Senior A Girls' Eagle Tag, Junior Boys' Eagle Tag, Girls' Tee Ball, Girls' Softball and Senior Girls' Volleyball teams. We wish them all the very best for great games! Fingers crossed for fine weather! 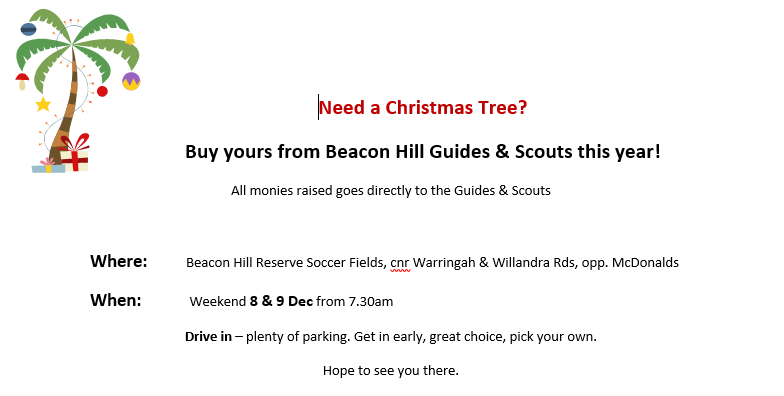 A chance to say thank you to our wonderful community- PLEASE SAVE THE DATE! 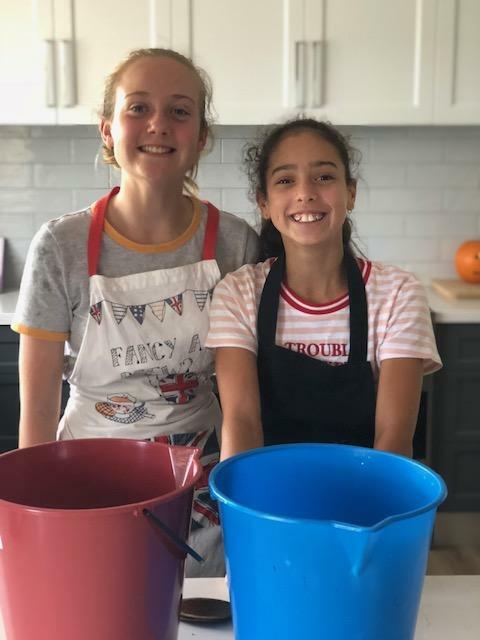 We would like to say a big thank you to our wonderful school community who have helped our children and our school in so many different ways this year and we would just love for all of you to join us for a special breakfast on Wednesday 5 December from 8.30am so that we, the staff, can thank you for everything you have done this year. You have helped make our jobs easier and more importantly, have contributed to the education of our children and to the fine reputation of our school. This is our chance to show you our appreciation so please come along if you can! Although we are hopeful that invitations will make it home, we also know through experience that from time to time things can get lost in the bottom of school/ chair bags. So if for some reason your invitation does not appear over the next week or so, please do come as we look forward to sharing breakfast with you all! 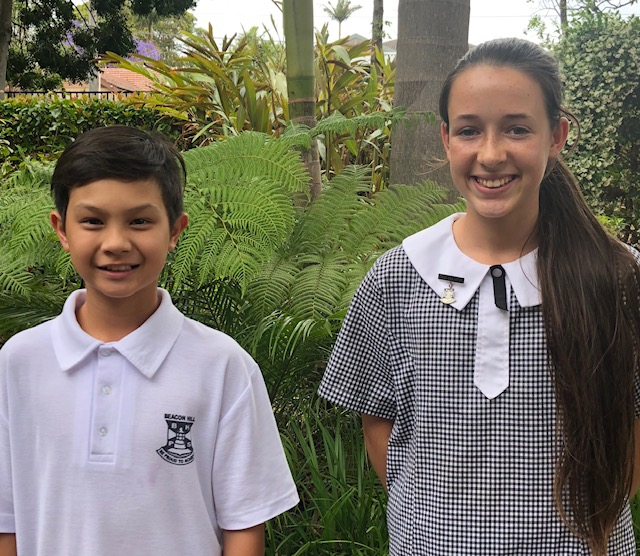 Last Thursday, Keith Solis and Sienna Villacorta-Bateman represented Sydney North at the State Athletics Carnival. Keith finished in 5th place in the Junior Boys High Jump. Sienna finished in 4th place in the Senior Girls 800m, which makes her first reserve for the National Championships. 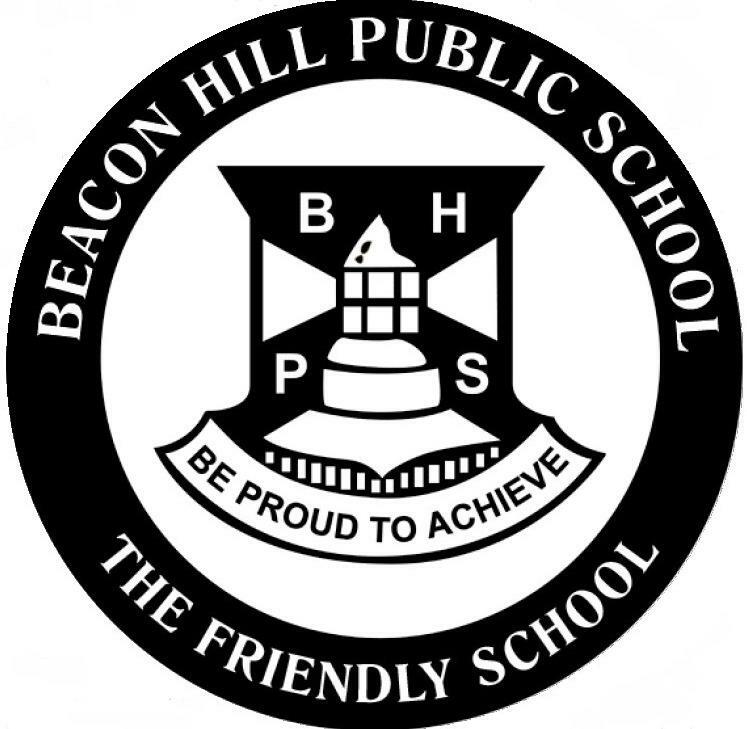 These are outstanding results from two of our very talented athletes here at Beacon Hill. Congratulations Keith and Sienna! 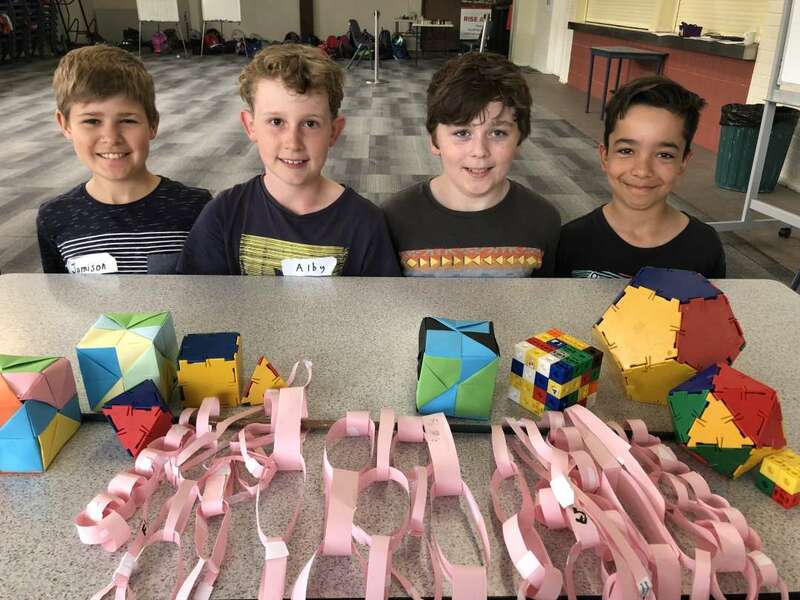 Last week, Jamison, Alby, Liam and Oscar attended a Maths Challenge Camp at the picturesque Elanora Uniting Conference Centre coordinated by leaders from Northern Sydney schools with 81 other Year 5 students from across PCS, the NBLA and Warringah schools. Over the 2 day camp, students enthusiastically investigated the big ideas of mathematicians Plato, Pascal, Fibonacci and Escher while working towards 2 goals - making a new friend and thinking like a mathematician. 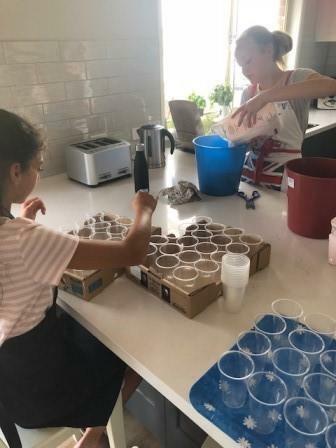 All reports indicate that both goals were achieved, with a lot of team work, problem solving and acceptance of a challenge. 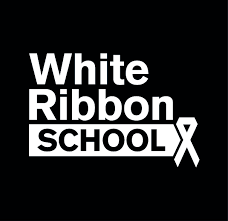 The SRC will be holding a White Ribbon Day of Respect on Friday 23rd November where students will wear white/ touch of white and students can buy a white ribbon (we have 120 to sell at $2 each). All students encouraged to bring in a gold coin donation for wearing a touch of white to raise money for White Ribbon. Students will also be participating in class discussions and activities on RESPECT. Including what respect looks like and sounds like in a variety of contexts. Each student will also make a white ribbon with messages/ poems of respect. The SRC will create a large white ribbon the top school oval to demonstrate our school’s commitment to being respectful at all times. Please help us support this worthy cause. 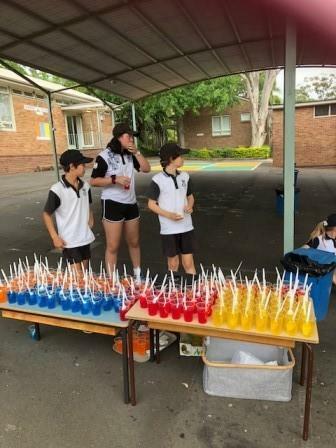 We also congratulate our graduating Kindergarten and Year 6 students and formally introduce our Student Leadership team for 2019. There will be limited reserved seating available via online bookings on Trybooking for parents/carers of award recipients and graduating Year 6 students. The details for Trybooking will be provided with invitations for award recipients and graduating students to be sent home next week. Other seating capacity will be available on a first come, first served basis. In order to meet WHS regulations, standing room will only be available at the back of the hall and the side aisles must be kept clear. We look forward to sharing this celebration of awards with our community. Congratulations to all of our wonderful students who received the Caspian award at the shade structure assembly on Monday 12 November. We are very proud of you! Teachers will be looking for students over the next fortnight who are displaying the qualities of OPTIMISM like OCTAVIA, seeing the possibilities, trying your hardest, displaying the right attitude towards everything and embracing resilience as the key to success. 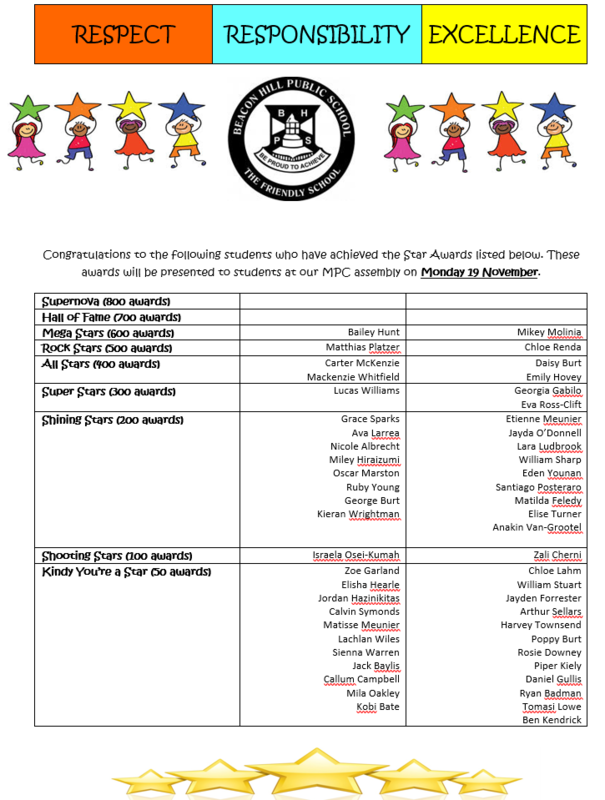 The following children have received the Aussie Star Award for Excellence. They consistently strive to "Reach for the Stars" in all they undertake by giving their personal best to any task. 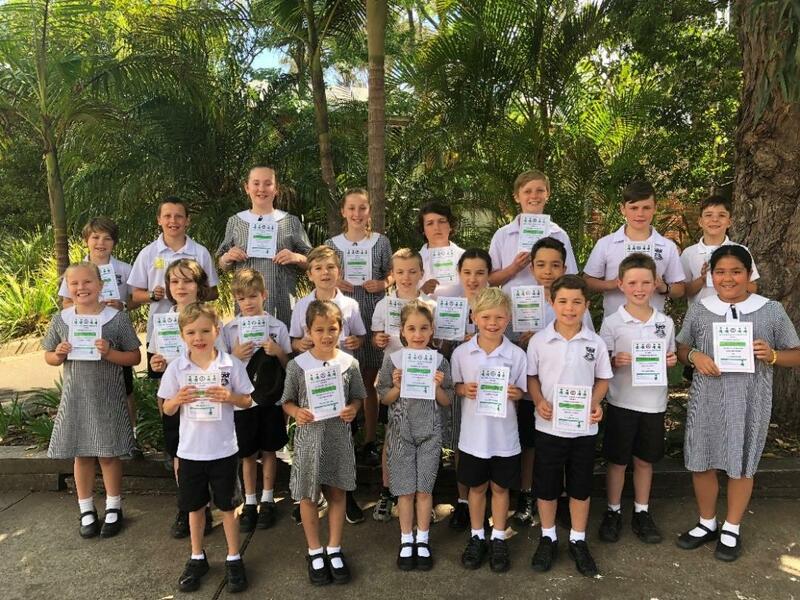 Edwards Macleod KA, Ava McKenzie KG, Kobi Bate KW, Amelia Lazzopina 1C, Lachlan Thompson 1M, Keira Loko 1/2G, Jayda ODonnell 2DC, William Sharp 2M, Maisy Campbell 2W, Edward Stearn 3M, Ben Campbell 3E, Annalise Kline 3/4N, Beauella Darsley 4A, Caitlin Williams 4H, Milo Lombardo 4R, Cody Sheedy 5B, Bailey Poole 5S, Joel McManus 5T, Mia Graham 5/6N, Charlie King 6M, Shraya Prajapati 6O, Dylan Lee 6R. Welcome to our Junior Band 2019! We have 45 enthusiastic and excited students registered for our Junior Band next year which is wonderful. All communications and planning will now be done via email. If you did not receive a “Welcome to Junior Band” email from Kaz Cerneaz on Monday 12 November, please let Kaz know (kaz@cenika.com). If you missed the registration deadline but would still like to join, please email Kaz directly. 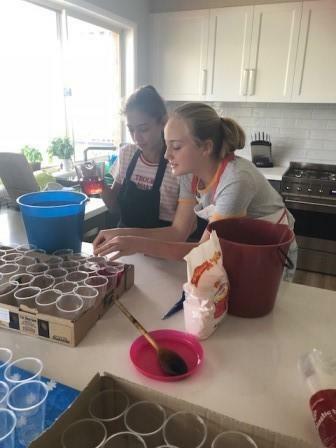 Congratulations to Jazzy and Alice on all their efforts to make jelly day a great success once again, they have raised $340.00 towards Cure for Brain Cancer. On Wednesday November 28, Year 6 will be holding a Pizza/popper fundraiser. The cost is $5.00 for 2 slices of pizza and a popper. This year you can again order your pizza/popper through the flexi school’s site just like a canteen order. This will be up and running to use from Monday. Orders will be accepted on the site up until Monday 26th November at 3pm. 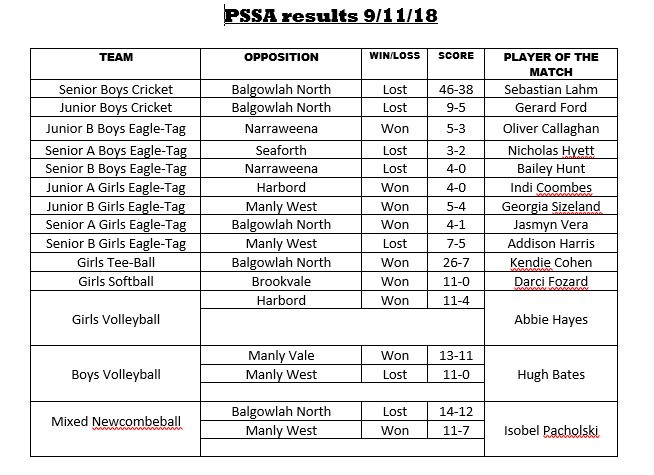 The final round of Summer PSSA was played last week and it's now down to the business end of the season! Semi Finals/Friendlies will be played this Friday 16th November. ALL SUMMER PSSA TEAMS WILL BE GOING ON BUSES TO THEIR USUAL GROUNDS. All other Summer PSSA teams will be playing in friendly matches. 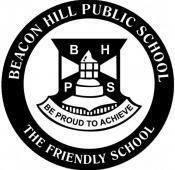 Good luck to all of our teams representing Beacon Hill!